Vilebrequin "Mistral" swim trunks in mini fish embroidery. 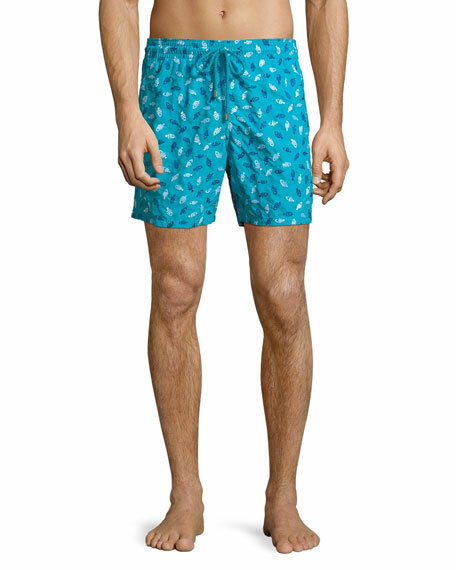 EXCLUSIVELY AT NEIMAN MARCUS Vilebrequin "Mordore" swim trunks in metallic wave print. Side slash pockets; back flap pocket. Drawstring waist. 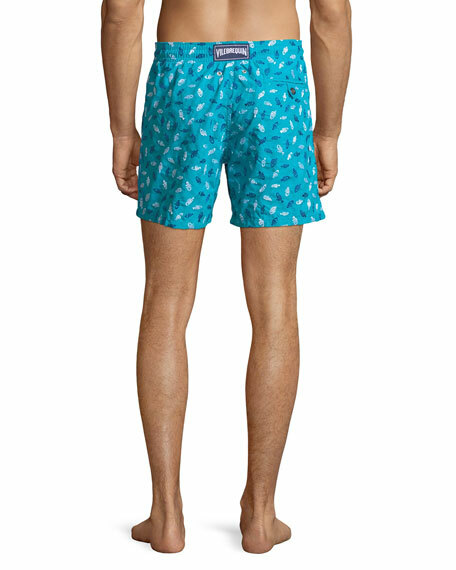 EXCLUSIVELY AT NEIMAN MARCUS Vilebrequin "Mordore" swim trunks in metallic wave print. Side slash pockets; back flap pocket. Drawstring waist. Rear eyelets for air evacuation; logo patch at back waist. Straight legs. Hem hits mid-thigh. Nylon/spandex. Imported. Vilebrequin swim trunks in graphic hypnotic turtles pattern. Side slash pockets; back flap pocket. Drawstring waist. Rear eyelets for air evacuation; logo patch at back waist. Straight legs. Hem hits mid-thigh. Nylon/spandex. Imported. Model's measurements: Height 6'1"/185cm, waist 32"/81cm, typically wears size M.
Vilebrequin swim trunks in modernist fish print. 15.6" approx. outseam. Side slash pockets; back flap pocket. Drawstring waist. Rear eyelets for air evacuation; logo patch at back waist. Straight legs. Hem hits mid-thigh. Nylon. Imported. Model's measurements: Height 6'1"/185cm, waist 32"/81cm, typically wears size M.